All any artist can ever hope for is that their images will live on, inspiring others, long after they’re gone. The suede and wool jacket was in a blue garment bag hanging over a chair at the Dorothy Ramon Learning Center in Banning, California. Inside, was a jacket made of soft brown suede with gnarly white sheep’s wool lining. Hanging next to it was a shoulder bag made of the same material. But the design on the outside was the most amazing. 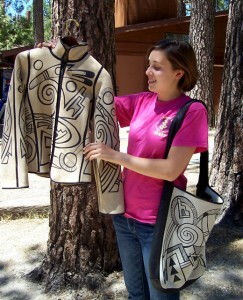 It showed bold lines and strong characters, things that are held dear and sacred to the Hopi Indians. The suede jacket and shoulder bag were going to be on display next Sunday, during a tribute to the Hopi Indian painter, poet, silversmith and philosopher who taught at Idyllwild Arts for 26 years. According to news reports, Michael Kabotie, 67, died Friday, Oct. 23, 2009, at Flagstaff Medical Center after battling the H1N1 flu and associated complications. He was from the village of Shungopavi, located on Second Mesa on the Hopi reservation, but had also lived many years in Flagstaff and New Mexico. He created many beautiful works of art, among them murals at Sunset Crater and the Museum of Northern Arizona, and a gate he designed to look like a piece of overlay jewelry at the Heard Museum in Phoenix. According to his web site, Michael Kabotie was born in 1942 on the Hopi Indian Reservation in northeastern Arizona. He grew up in Shungopavi and graduated from Haskell Indian School in Kansas. In his junior year there, he was invited to spend the summer at the Southwest Indian Art Project at the University of Arizona, where he met Joe Hererra, who became a lifelong friend and mentor. Michael studied engineering at the University of Arizona, but left to hold a one-man show at the Heard Museum in Phoenix. His work was featured on the cover of Arizona Highways magazine. Fine Arts Movement, creating paintings that reflect traditional Hopi life in contemporary media. Fred was one of the Hopi artists responsible for developing the trademark overlay methods used by many Hopi silver and goldsmiths today. He is also the painter of the “Desert View Watchtower” murals in the Grand Canyon. In his silver work, Michael used the overlay technique developed by his father and friends, but in his own jewelry, he developed a unique style of his own that is also reflected in his paintings. 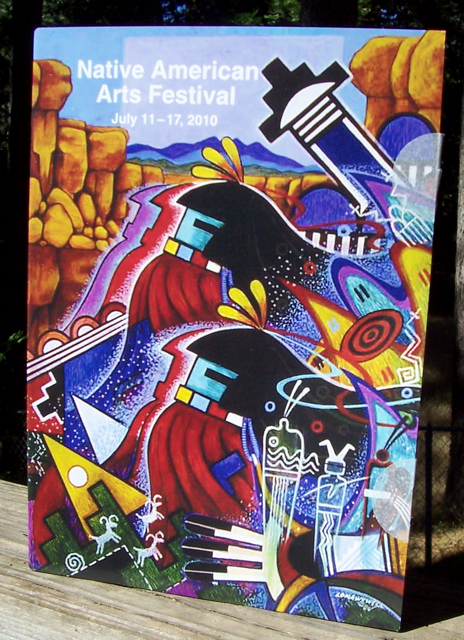 In 1973, Michael was a founding member of “Artist Hopid,” a group of painters who experimented in fresh interpretations of traditional Hopi art forms. Michael’s works appear in several museums around the world, from the Heard Museum in Phoenix to the British Museum of Mankind in London, England, and the Gallery Calumet-Neuzzinger in Germany. His book of poetry, “Migration Tears,” was published in 1987 by UCLA. Michael has lectured across America, in Germany, Switzerland and New Zealand, and has taught Hopi overlay techniques at Idyllwild Arts for many years. To honor him, Idyllwild Arts will host a “Tribute to Michael Kabotie,” on Sunday, July 11, with a pottery trunk show, with discussions by his son, Paul, and other family members. The tribute kicks off the weeklong “Native American Arts Festival” at Idyllwild Arts that includes Native American performances, lectures, films and pottery demonstrations. According to the invitation, the festival will explore topics that were of particular interest to this extraordinary artist and teacher: the trickster concept, the artist’s journey, healing and recovery, music and chanting traditions, and cross-cultural dialogue. Moreover, you will see Michael Kabotie’s images all summer long at Idyllwild Arts. 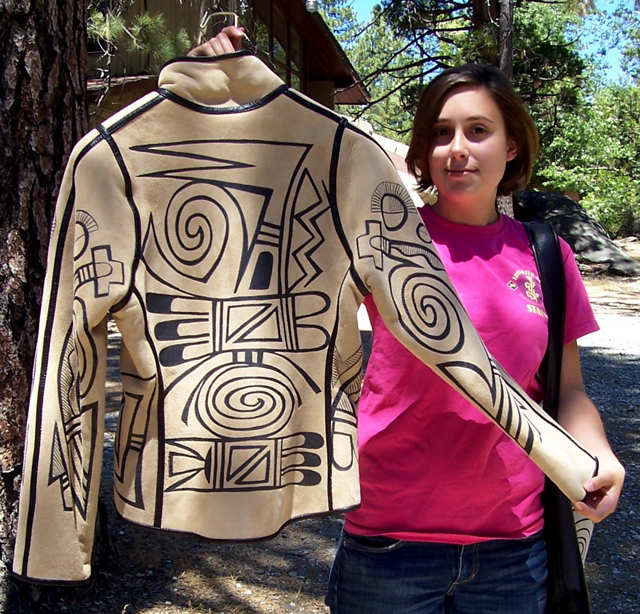 The T-shirts worn by the Summer Program staff, counselors and students features a bright pink Hopi image similar to the one featured on the suede jacket.